Home » Bhangarh » Bhangarh – The Haunted City!! Do you know the history of an abandoned city in Rajasthan? The Name of the forsaken town is the Bhangarh Fort. This city is in the state of Rajasthan is very popular for its historical devastations. Bhangarh township was established by a royal leader ‘Madho Singh’ who was the younger brother of a Mughal ruler, ‘Man Singh of Amber’. This ancient Fort was established in the year 1613. More than 10000 houses made this place chronologically momentous. Soon after Bhangarh Fort was built, it was deserted and isolated. On the other hand, this artistic fort offers a fundamental insight of the primordial Mughal history to the tourists. This atypical fort holds quite a few stories of its exquisiteness. According to what is being said, this fort was abandoned as it was cursed by an ascetic conjurer. To date, people believe that a person could not return back alive if, he or she stays in Bhangarh city after twilight. The villagers who live in close proximity to Bhangarh declares that the roof of any newly-built house in Bhangar goes to wrack and ruin immediately even today. The “Archaeological Survey of India (ASI)” has kept a sign board that states, “Staying in the boundary limits of Bhangarh after sunset is strictly forbidden. If a person fails to follow the directions, legal action would be taken against him”. Basically, there are 2 stories about this haunted city – Bhangarh. 1. In accordance with a fable, Bhangarh city was cursed by “Guru Balu Nath” who authorized the construction of the city on a major stipulation: “If the shadows of your fortress touch the prohibited area, the entire Bhangarh city will be destroyed!”. Since Ajab Singh (the grandson of Madho Singh) built a palace in such a way that the shadow of the palace reached the prohibited area, the place was cursed by Guru Balu Nath. As a result, the entire town of Bhangarh was damaged and ruined. Guru Balu Nath is believed to be resting in the same place till now in his Samadhi. 2. One more chronicle is about the Princess of Bhangarh Fort, Ratnavati, It is believed that ‘Princess Ratnavati’ was admired for her good looks in Bhangarh Fort as well as the neighboring cities. A Magician named Singhia was also mesmerized by her beauty and charm. However, he felt that the princess would never marry him owing to the difference between her gorgeousness and his status. So, the magician planned to shed a black magic curse on the oil that was bought for Princess Ratnavati by her servant maid. Since Princess Ratnavati had also been aware of the black magic, she threw the oil in the ground. All of a sudden, the oil became a rock and started to roll down the mountain. The magician who was at the bottom of the mountain realized that his death was reaching him. So, he cursed the Princess Ratnavati and her Bhangarh fort. It is believed that the Bhangarh fort got destroyed before the subsequent sunrise. Also, Princess Ratnavati passed away the following year in a war between Ajabgarh and Bhangarh fort. The premises of Bhangarh are delimited by a wall that is partly ruined. This ancient Fort has Havelis, Fine-looking gardens, Big Banyan trees and so many other attractions. The fort also has famous temples of Mangla Devi, Gopi Nath temple, Lord Someshwar and Keshav Rai. However, the mysterious allure in Bhanghar is an isolated “Chhatri” located at the crown of the hill. This Chhatri will quickly grab the attention of all tourists and visitors. Generally speaking, the unsystematic configuration of all these attractions in Bhangarh city will definitely make a person feel panicky and alarmed both in one go. Other ‘well-known’ Forts that are located near Bhangarh are Ajabgrah Fort (built by Ajab Singh) and Pratapgarh Fort. Unquestionably, Bhangarh Fort is an archaic city with a strong archeological significance. One can see the wild growth of some rare kinds of bushes and shrubs beneath the elevated mountains of Bhangarh even today. Archeological studies reveal that there were beautiful valleys and cascades in this place a long time ago. At present, one such eye-catching natural spring can be found in the vicinity of the Lord Someshwar temple. A number of prehistoric tools that were used by early men has been unearthed in Bhangarh fort by the “Archaeological Survey of India (ASI)” at the time of a recent excavation. Is Bhangarh really a haunted place? A number of travelers from various parts of the world visit this “atypical” Bhangarh city. 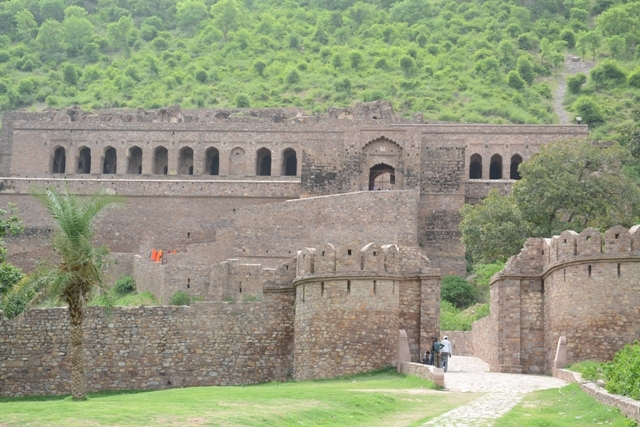 Most of the tourists say that they get an odd feeling by the ambiance and appearance of the Bhangarh Fort. This also leads to some weird symptoms such as nervousness and agitation in the visitors. Even today, the local villagers have faith in the re-incarnation of the beautiful Princess Ratnavati. People wish Bhangarh Fort to get free from the prolonging curse.